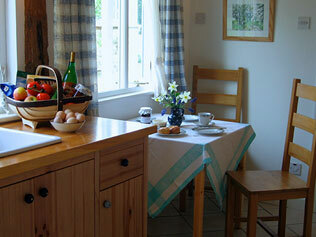 The beamed cottage is freshly decorated, featuring contemporary works by local artists. 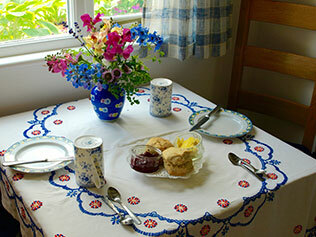 Each room will have fresh vases of garden flowers and there will be a cream tea awaiting guests who are with us for a week or more. In summer, visitors have exclusive use of the owners’ heated swimming pool in the afternoons. Full central heating is included in the price. 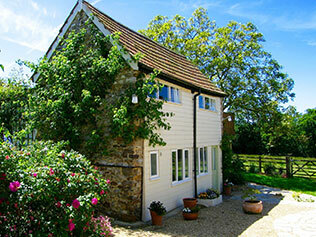 The gardens surrounding the cottage are carefully designed to provide interest throughout the year. Early spring bulbs and blossom are followed by vibrant summer colours and scent. Late perennials flower until the first frosts and the surrounding trees have autumn tints. 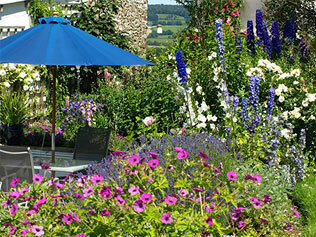 In sheltered spots among the well-stocked borders are seats and sun loungers from which to relish the peace and quiet and to enjoy far reaching views. The property is surrounded by meadows. If you would like a few nights extra before or after your stay, or if you have relatives or friends who would like to stay next door, we can provide bed and breakfast in the main house. Click here to see what we offer. We also own and let a gorgeous villa in Turkey, with sunshine all year round. To see the villa, click here.